An airport is not necessarily the first place people associate gourmet dining experience with, unless, of course, you’re at the Jet Blue terminal in New York’s John F. Kennedy International Airport. If you’ve flown to NYC with this modern airline in recent years, you know what I’m talking about. Terminal 5 looks more like a spacious shopping mall with great restaurants and stores rather than an airport terminal. There’s even a touch-screen monitor in the middle of the terminal where you can order food and drinks and a server will bring the food straight to your gate. I hope Los Angeles and / or Burbank airports would offer such service! Oh, how time has changed. I was able to resist the shopping temptation (well, sort of, if you don’t count the shopping bag full of stationary I picked up at Muji), but I could not stay away from walking in to one of the alluring restaurants that sit in the middle and around the circular terminal. Dining selections here include a casual cafeteria (with the usual selections of sandwiches, salads, pizzas and boxed sushi, etc. ), a steak house, a sushi bar, and a seafood place, among many others. Everything looked wonderful, but one place that caught my eyes in particular was a small French brasserie that sat on the very end of the restaurant row. 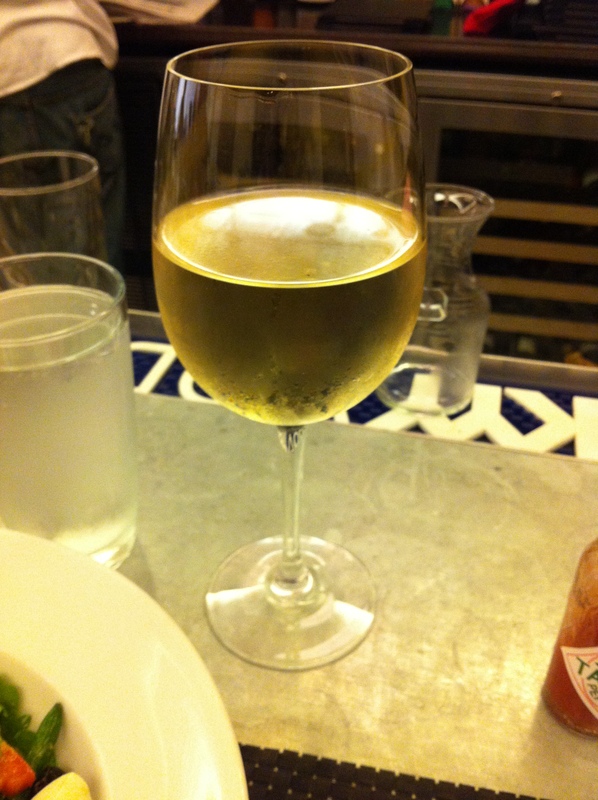 I sat at a bar counter at Brasserie La Vie and treated myself to a glass of Chardonnay to celebrate the end of the work week in NYC. The place is totally cute, offering seemingly authentic dishes like Escargot with Garlic Butter, Duck and Pistachio Terrine, and Moules Frites aux Pernod (mussels and French Fries) on the menu — something you’d expect to find at a brasserie / bristro in Paris, certainly not in a middle of the busy airport terminal in the states. There are more mainstream items on the menu as well, like French Onion Soup and Croque Monsieur / Madame. Particularly craving something light, I ordered Salad Nicoise (no surprise here as I am obsessed with this salad) with a side of Pommes Frites (the ultimate guilty pleasure). The salad was pretty darn delicious, with vinegary anchovy fillets and seared tuna atop a bed of arugula, tomatoes, haricot verts, olives, boiled eggs, and roasted peppers tossed in vinaigrette. Each bite went incredibly well with the glass of chilled white wine, with a side of crispy French fries with a touch of ketchup and Tabasco. 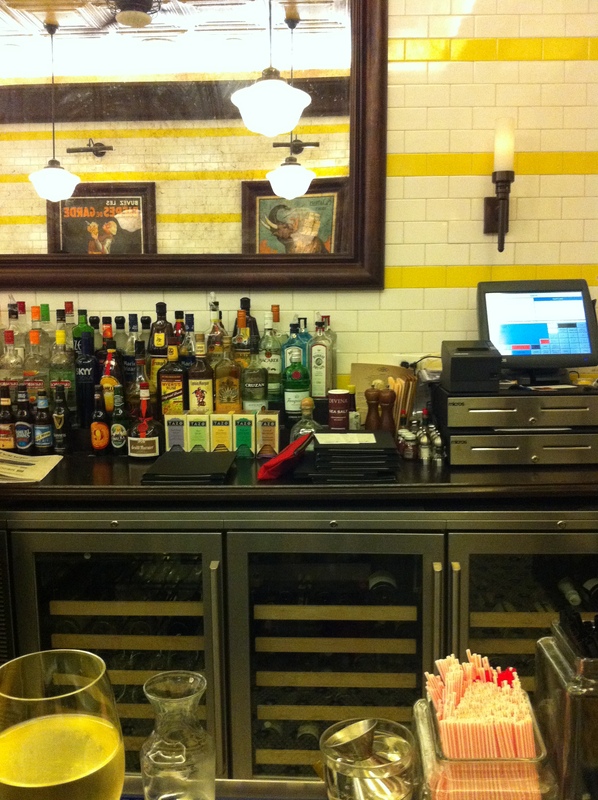 I’m not sure if it was the atmosphere of the brasserie or the fact that I was finally coming home, but I was feeling very happy sitting at the counter at the restaurant. I had a few hours to kill before my flight, and while I usually get bored and antsy waiting, that was not the case this day. I caught up on my leisure magazine reading and just enjoyed the time passing by, while soaking up the energy of New York City.